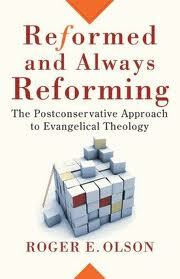 In outlining the difference between conservative and postconservative evangelical theology, Olson makes a fascinating proposal. For him, evangelicalism has always faced the challenge and rewards of its dual origins in two different streams of Christianity – Puritan and Pietist. The Puritan stream has emphasised doctrinal correctness and seen theology as the task of systemising the Bible into doctrines and then defending these formulations (basically already completed) against innovations. The Pietist stream has tended to make the experience of conversion and discipleship the primary mode of faith, with doctrine flowing from this. (This is a simplification of his generalisation, so bear that in mind before picking holes in it.) I don’t identify with either of these streams, but I am very sympathetic to the postconservative evangelical theologians. Today, conservative evangelicals (inheritors of the Puritan stream) tend to look at the Bible primarily as a means of information. Postconservative evangelicals (inheritors of the Pietist stream) look at the Bible just as much as a means of transformation and encounter; just as important as propositions are stories, parables, poetry in the Bible which call for our response and participation. Postconservatives also believe that no post-canonical formulation of doctrine can be seen as final and beyond questioning; they tend to encourage theological imagination and creativity. Olson believes conservatives are susceptible to an ironic kind of traditionalism. Despite the fact they tend to downplay tradition as a source for theology, conservatives will often defend Reformation (or later) formulations of doctrine as fixed and final, because they take them to be the only faithful way to understand the biblical witness. Still, I understand their dilemma. They hardly want to be ostracised by the evangelical community or tarred with the same brush as Rob “Antichrist” Bell. For the record, I do not endorse the contents of any of the books by John Piper on the shelves of my library. I stock them purely as a service for people who want to know what the author is writing about. Same goes much more strongly for Richard Dawkins, just in case you thought I was an atheist.